You’ve enjoyed the meals made by your mom throughout the year. But, on Mother’s Day, it’s your turn to make her feel special and surprise her with some awesome recipes. If you’re not a great cook, don’t worry. We’ve got some healthy and tasty recipes for you. 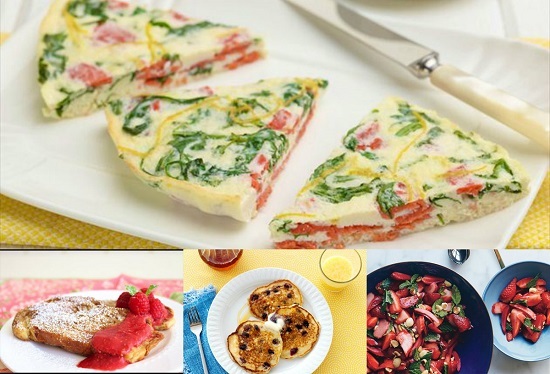 Here are 4 easy breakfast and brunch recipes that you can cook for your mom on Mother’s Day! This healthy recipe will be a perfect start to your mom’s special day. There are 3 main ingredients to this recipe, arugula, lox and lemon zest. Firstly, whisk the egg whites until fluffy in a medium bowl, then add whipping cream, lox, salt, pepper and lemon zest. Heat olive oil in a non-stick skillet (ovenproof) over medium heat. Add arugula and garlic to the skillet. After cooking them for 1 minute, pour the egg white mixture into the pan and stir to mix the ingredients properly. Cook for another 4 minutes without stirring and then put the skillet into the oven (preheated to 350° F). Bake for about 10-12 minutes. The egg white frittata with lox and arugula is ready! Plan ahead a day or two to make this wonderful toast. First off, slice the cinnamon bread into cubes and place them in a greased baking dish. Mix eggs, milk, brown sugar, nutmeg and cinnamon in a bowl and then pour the mixture over the bread cubes. Refrigerate it for 8 hours or overnight. Add a twist to the Mother’s Day special brunch, by making lemon blueberry pancakes for your mom. The sweet and sour flavour of these pancakes goes perfectly with the rest of the items in the menu. Mix cake flour, sugar, baking powder and salt in a bowl and set it aside. Now, mix evaporated milk, lemon zest, and juice in a separate bowl. Let it sit for 5 minutes and then add vanilla and egg. Combine both the mixtures together and stir well. Add melted butter and blueberries while stirring. Splash a small amount of evaporated milk if the mixture becomes too thick. Heat a skillet over medium-low heat and put some butter on the skillet. Pour the batter measured with cups and fry the pancakes carefully on both sides until they turn golden. Garnish it with softened butter and serve it hot with a glass of your mother’s favourite fruit juice. Time to use seasonal fruits and combine them to create a healthy breakfast for your mom. The strawberry-rhubarb salad with mint and hazelnuts is easy to make and highly nutritious. Place the pan on the stove over medium heat and toast the hazelnuts by stirring them around every minute or so. Watch them carefully as they get overcooked very easily. Cook them for 5-10 minutes until they turn brown. Let them cool and then chop. Now, mix rhubarb, lemon juice, sugar, and Cointreau in a bowl and let it sit (for about 30 minutes) till rhubarb releases its juices and gets softened. Toss it with mint, strawberries, and hazelnuts. The healthy and tasty salad is ready to be served. This Mother’s Day, treat your mom like a queen (well, she is a queen). Take initiative and cook a healthy and tasty breakfast for her. Sprinkle some joy, garnish it with love and serve with a smile. Enjoy!